"Locally-led Conservation of Water, Soil & Natural Resources"
Everyone lives in a watershed but not the same watershed! A watershed is the landscape water flows across, or under, as it travels to the lowest point in the topography: a stream, lake, or river. Along the way, water travels over the soil surface - across farm fields, forest and ranch lands, suburban lawns and city streets, or it seeps into the ground and travels to the lowest point as ground water. 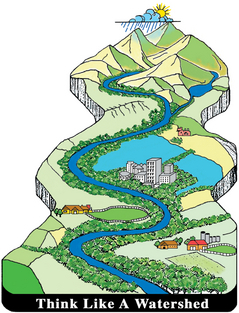 Watersheds come in different shapes and sizes, all with different features. Some have hills or mountains, others are nearly flat. In Wyoming we have more than 80 different watersheds throughout the state; Natrona County contains a portion of 12 unique watersheds all draining directly or indirectly to the lowest point, the North Platte River. Regardless of the name or location of the watershed, we all influence what happens in a watershed, good and bad, by how we treat the naturally occurring resources: soil, water, air, plants, and animals. All of the watersheds on the continent are inter-related basins, so what happens in one watershed effects a larger watershed downstream ~ all the way to the oceans. The North Platte River is a valuable and important resource to all who live near it. It provides drinking water, irrigation water for farms and ranches, urban lawns and gardens, recreational opportunities for residents and tourists, important wildlife habitat, and a beautiful scenic feature to the local landscape. The Kendrick Watershed area is approximately 188 square miles (120,320 acres) in east central Natrona County. The watershed contains numerous small streams, drainages and ponds with the North Platte River being the major water feature. Land use in the watershed is primarily farm, ranch and range land. The semi-arid climate requires irrigation to supplement naturally occurring moisture to support crops and pasture land. Wetlands and associated riparian areas occur within the Kendrick watershed. These wetlands range from marshes to open water, large closed basins, seep areas, small reservoirs, stock ponds and riparian areas saturated with groundwater. The wetlands are important resources to migratory birds, including waterfowl, shorebirds, waders and other birds and provide natural habitat for other wildlife. The North Platte River and the alluvium along the river are sources of water for domestic and industrial uses, and municipal water for the City of Casper and other communities. Click on a Newsletter icon to see a full Kendrick Project Newsletter. 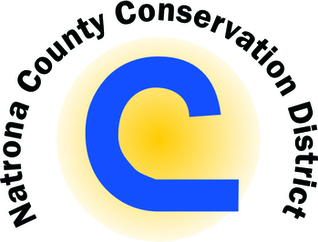 Conserving natural resources for our future.